This Ain’t No Video Game, Kid! Jack Klements lives in Seattle with his parents and is doing just fine. But when his swaggering Irish cousin Finn turns up, Jack can tell this is not going to be a good summer. 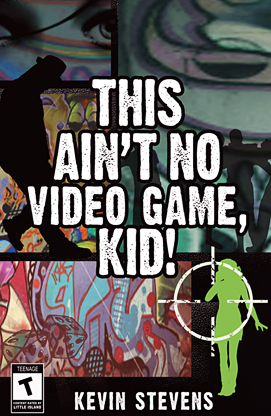 Finn is obsessed with a violent computer game, and when he meets a Latino gang in the inner city, he thinks he can have a slice of the action. How can Jack reconcile the demands of his straight-laced parents, the pressure to be loyal to his wayward cousin, and his growing attraction to Carina, who hangs out with the gang? If only Finn would disappear! But then he does just that, and Jack is more torn than ever. This pacey debut as a writer for young adults is a tense and gritty story of home values threatened by street culture, with the menace of gang violence never far away.